Couponing Momma Giveaways & Reviews: Get Swagbucks and a cup of coffee from Dunkin' Donuts! 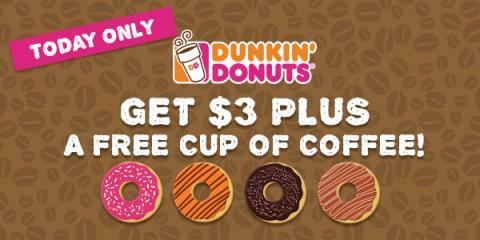 Get Swagbucks and a cup of coffee from Dunkin' Donuts! If you haven't tried out Swagbucks yet, you can sign up through the link above on your way to cashing in on this offer. For those who don't know, Swagbucks is the site where you earn points (called SB) for the things you do online every day: searching the web, watching videos, discovering deals, answering surveys, and more. Then you turn those points into free gift cards to places like Amazon, PayPal, and Target. They run all sorts of offers like this, some of which can make you thousands of SB!